Is your company properly qualified? Precision Garage Doors is fully licensed, bonded, and insured. Documentation is available upon request, as we’re always open to fully disclosing our information with customers. A limited lifetime warranty covers defects in workmanship, and is good for one year after a new garage door installation or complete overhaul; a manufacturer warranty covers the door and its parts. What if my garage door breaks after hours? Not to worry. Emergency service is available 24/7, so our technicians can reach you day or night. Plus, our trucks are stocked with a full range of garage door parts and accessories, so repairs can be completed quickly with no unnecessary wait time. Do you employ your own garage door specialists? Yes. All our technicians are full time employees. We never use subcontractors; rather, we fully train our workers at state-of-the-art facilities to ensure they are up on the latest garage door systems, products, repair methods, and tools and equipment. Do you use standard replacement parts? In fact, we use the highest quality replacement parts in the industry. Our priority is to get your garage door operating smoothly for as long as possible, while being as safe as it can be to you, your kids, pets, and automobile. Yes, we do. Contact your local Precision Garage Doors location to discuss the requirements of your commercial property and we will make the appropriate arrangements wherever possible. If my garage door jams, can I fix it myself? You can if an object such as a shovel or broom is stuck in the track, or if your garage door is locked. But if a garage door spring is broken, the door is off its track, or there’s some other mechanical problem, you can take a look and let us know what’s wrong. Then give us a call and our technicians will take it from there. Same-day service is available 24/7 if you have an emergency. This article can shed some light on why your garage door is jammed. It all depends on why your garage door won’t open. If the remote doesn’t work, maybe you need to replace the battery. Check if the lock handle on your automatic door is engaged before you call us. If a spring is broken, a cable is worn out, or a gear looks stripped, call us right away and we’ll send a technician out. Learn here about fixes you can do and what you need a tech for. Why does my garage door shake when it moves up or down? There can be many reasons your garage door shakes. It could be a problem with a garage door pulley that has loosened or weakened with age. Problems with rivets, ball bearings, and cables can result in a shuddery door as well. If it’s caused by old or worn parts, call a technician to check it out. Here is some more information about shaky garage doors and their causes. Does my garage door have to be so loud? We can make your garage door operate quietly. If you hear squeaks, we can lubricate your tracks and rollers; if metallic grinding is getting under your skin, we can adjust belts or chains, or inspect the motor or gears. Clinking can be coming from rusty old spring coils or defective rollers. Popping noises may mean the system needs lubrication, hinges are loose, or debris is stuck in the track, while complex clunks, thumps, and booms can indicate torsion spring or garage door opener problems. Whatever you hear and no matter how loud it is, our technician can fix your garage door so it’s the quietest in the neighborhood. How many visits does it take to fix my garage door? Just one! Our technicians are professionally trained. They are committed to timeliness and arrive in a fully stocked truck, so all the parts and accessories are within reach. No matter what is wrong with your garage door, our specialists can determine the cause and perform the necessary repairs and replacements in a single visit—and get it right the first time. How much maintenance does my garage door need? It depends on your garage door. Most of today’s garage doors don’t require much maintenance except for annual inspections and door balance tests. You can listen to how the door sounds and if any parts look damaged or worn. Test the springs by pulling the red emergency cord and opening the door manually to see if the springs are properly supporting it. Here are some more details about annual garage door maintenance. How do I know what garage door to get? Our most popular models are steel garage doors. Most garage doors on the market today are made of steel, which is durable, low in cost, and requires little or no maintenance. Other styles we offer include wood, wood composite, vinyl, and aluminum/glass garage doors. Click here to learn more about these options and contact our representative to discuss styles that may work best for you. Can you install a garage door in my home? Yes. We do both sales and installation. Contact your nearest location for a no-obligation consultation and a free estimate, which explains the entire job, and is signed before we get started. Single-, double-, and triple-layer garage doors are available. We also offer roll-up, swing-out, swing-up, and sliding options and a range of colors and add-ons such as windows in a variety of configurations. Should I have my garage door insulated? It is a good idea to install an insulated garage door. There are many benefits, including a warmer garage (polystyrene can raise the temperature of your garage by up to 10 degrees). Garage door insulation can increase energy efficiency in your home and reduce noise from the outside. Speak to our installers about multiple layers and thermal resistance, indicated by the panel’s R-value. Insulation can also reduce air seepage from your home, lowering your energy bills. Will I save with a cheaper garage door? Do your research when buying a garage door, as there are several factors you should think through. Cheap garage doors are often non-insulated and made of a lower grade of steel. Sturdier, insulated, and more durable doors may last you longer, saving you money in the long run. Here is some more information on cheap garage doors. Can garage door springs be fixed? We can fix your broken garage door spring. Our spring specialists are experienced dealing with various spring problems. We also offer heavy-duty, high-cycle replacement torsion springs that don’t require lubrication. These are oil tempered springs. While many garage door springs are known to wear within a few short years, ours can up to 4 times longer. Can I fix my broken garage door spring? We strongly advise against doing so. People have been severely injured or killed trying to fix springs under high tension. Winding a torsion spring requires special tools and purchasing the wrong spring can destroy your entire garage door. The risk of DIY garage door spring mistakes is too high. Call our technicians who know how garage door springs work and how to fix them. What type of spring does my garage door have? Garage doors have either torsion springs or extension springs. If you look above the garage door and see springs, these are the torsion type. They have metal cones at the ends and run along a metal tube connected to cable drums. Extension springs are on the sides of the garage door and are connected with loops. These visual examples, accompanied by more detailed information, should help you understand the differences between the two. Where can I find new garage door openers and accessories? We stock many name brand garage door openers, and even our own series of high-tech models. Continue browsing or contact our nearest location to learn more. How do I pick the right horsepower opener for my garage door? Customers are often uncertain about garage door opener size. The larger and heavier the door, the more powerful an opener you need. For example, a standard garage door will do just fine with a ½ horsepower motor. Larger garage doors will need 1/3 horsepower, while oversized doors may need as much as ¾ horsepower, an expensive solution yet durable and long-lasting. Learn more about garage door opener size from this resource. Do you sell garage door openers for low ceilings? We can help you choose a garage door opener if your ceiling space is limited. If there’s less than 5 inches between the door and ceiling, we can find a solution, including a LiftMaster opener and jackshaft motor that can be mounted on the wall instead of the ceiling. We also offer low headroom tracks and brackets and quick turn brackets that save inches of room. Here is some more information on low ceiling garage door opener options. How do I program my garage door opener remote/keypad? A Precision garage door opener remote control and keypad can be programmed in just a few steps. Follow our instructions to do so quickly. Can I open my garage door using my smartphone? We offer an iPhone and Android app that can be used to open and close your garage door, check its status, and receive alerts once you are signed in. It works with newer compatible garage door openers and with existing retrofitted systems. Learn more about how to install, set up, and use our Internet connectivity solution and app. What about those flashing lights on the garage door opener? 1 Flash: The safety sensor wire may be open/broken/disconnected. 2 Flashes: Shorted sensor wire or black and white wires are installed in reverse. 3 Flashes: A problem with the door control wires. 4 Flashes: Misaligned photoelectric sensor eyes. 5 Flashes: Overheated motor or RPM sensor failure. 6 Flashes: Motor circuit failure. 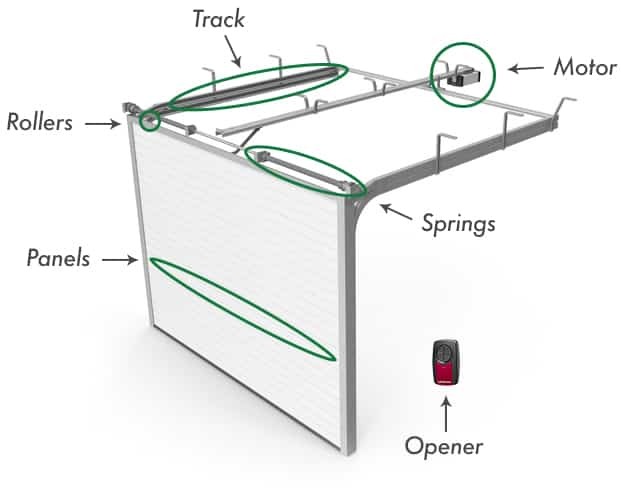 Click here to learn more about why your garage door opener is flashing. Why is my garage door opener running, but the door isn’t opening? There are a few reasons why the motor might sound like it is on, yet your garage door doesn’t open. Learn more about how to troubleshoot the problem. Obstructed or misaligned safety sensors, drained remote control batteries, or an activated lock switch are the most common reasons a garage door doesn’t work. See our quick fixes to get your door running again. If a garage door panel fails, can I replace just one? Sometimes. It depends on the problem you have. Sectional garage doors offer the advantage of replacing just one old or damaged panel, but you want to make sure it’s the right panel. Otherwise, you compromise aesthetics and potentially structural integrity. Allow our technician to take a look to determine the best approach, or if there is additional damage you can’t see. Here are some more insights on garage door panel replacement. What is the purpose of a garage door seal? Found on all four edges, a garage door seal is an important part of your garage door. It helps to keep out rain, snow, insects, and debris as well as cold and moisture. The types of garage door seals include bottom seals (weather seals), threshold seals (for the floor below the door), and brush seals (on commercial doors). If you see a cracked or buckled seal, or feel a draft from under the garage door, replace the seal as soon as possible.